One reviewer says, "Fabulous. Different. Odd. Crazy. Wonderful. I've never read anything like it. You've created the weirdest, coolest new genre of fiction and I love it." Two of the three will see a ghost, one will become a ghost and everyone will learn that life is hard to let go of even when you’re dead. And that's just Book One. Designed to read like a supernatural soap opera, Onyx Webb is a paranormal suspense series, with supernatural romance, as well as a dash of historical fiction. The stories may haunt you, the darkness may disturb you, but ultimately you’ll be reminded to treasure every moment of your life because… If you think life is precious now? Just wait until you’re dead. Welcome to Bookish, Andrea and Richard!​ In tweet form (140 characters or less), how would you describe the story of​ Onyx Webb to those who haven’t heard of it yet? 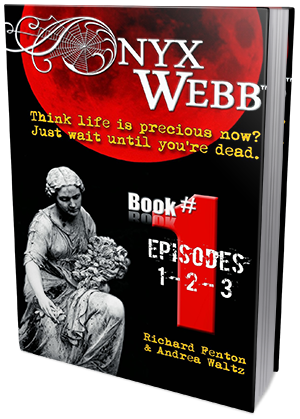 Onyx Webb is about a billionaire family, a missing piano prodigy, and the unusual life of Onyx Webb herself, in one web of a supernatural soap opera. The hardest part is deciding how much of the story to tell and where to begin. Because we write with movies and t.v. in mind it is important to give context to the location. Sometimes we jump in without describing where we are and want to dig into what is happening. And because we have three to four narratives running simultaneously, we need to keep things punchy and moving. But, like a fast paced movie, you still need scenes where characters can communicate and the reader can enjoy a slow moment. So we work hard to balance all that out. Our favorite part is creating those OMG moments. We kill off a character at the end of Book Two (out in July) and we know our readers are going to freak out but that is the point. And it can be painful to lose those characters too! One of our characters is a total diva – Mika Flager, she is Koda Mulvaney’s ex-fiancée and we call her the Socialite of Savannah (think Paris Hilton). So anything with her involved is grand and over the top and it makes her scenes so fun to write. What was your happiest moment during this whole writing/publishing a book process? Being done is always fabulous. But since this is a long running series that can’t be the happiest moment for a while. We made a decision after reading some advice to writers from Kurt Vonnegut and we made a couple major shifts to our series and letting our readers ‘in’ on a whole lot more information and it made the series so much better. We take a lot of what we see (movies and tv) and apply it to our writing in terms of story. As for writers, Richard loves Lee Child and also Harlan Coben. Andrea’s earliest influence was Judy Blume and V.C. Andrews books, but these days any book off the Oprah Book Club list. We’re also just starting to read more indie author fiction like ourselves! It had been two days since the Restoring Savannah banquet, and the girl in the mirror was all Koda could talk about. “Think what you want, Dane, but I saw her,” Koda said for the third time, getting up from the leather sofa in the center of the penthouse apartment in the 55 West building and starting to pace. “I… saw… her,” Koda said again. “Okay, okay. You saw a girl in a mirror,” Dane said. “But I don’t get why you’re so freaked out?” “We’re best friends, right, Dane?” Koda asked. “You gotta ask?” Dane was tempted to mention the fact that Koda had punched him in the face when they were at the bar at the Mansion on Forsyth Park, but didn’t. Dane shook his head. Like most people, Koda Mulvaney had a variety of character flaws, but being a liar was not among them. Dane went silent and took in what he’d just been told. “Okay, what color was her hair? “So it was an old woman,” Dane said. “Don’t go there,” Koda said. Koda shook his head from side to side. “Was she pretty?” Dane asked.